What is the Seating Like in the Ford EcoSport? There are two things that buyers are looking for in a compact SUV. One is cargo carrying capability, but the most important is the seating capacity. An SUV is a relatively new concept on the market—generated from the old station wagon idea of carrying a family across town or the U.S. with some degree of comfort. 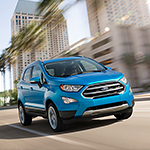 Come to Sternberg Automotive Group and sit in the EcoSport to experience the feel of space for yourself.